The final rush. First a morning visit at the “Frank Sinatra School of the Arts,” founded by Tony Bennet, and then the last performance, on the Metropolitan Ballroom stage, at the Clinton Global Initiative. The day started with autumn showers, as we dived into a classic school day, surrounded by hundreds of American students. The New York City Department of Education public school structure is no less than 5 stories high! This is a place that is filled with art and adolescence, and this is an opportunity for our kids to observe the talented kids hard at work. This is a true ‘incubator’ of art, with orchestras, choirs, dance, fine arts but also labs and classrooms. However the most exciting moment, after lunch in the school cafeteria, was in the “Tony Bennet Concert Hall”, where the “Voices of Haiti” performed, after being introduced by the director, Malcom J. Merriweather, who recounted the didactic and existential journey gone through by the kids, whilst introducing our Haitian collaborators (who also performed solos at the concert hall). Everyone was warmly welcomed by loud claps and whistles. The Voices of Haiti performed a wide range of songs from their repertoire, followed by the American students performing their own vocal show. After this rush of enthusiasm, we are certain, will nurture the dreams of the Haitian children and will convince them to follow them through. The last stretch, was in front of a very important audience (once again alongside Andrea) at the annual 2016 CGI, during the “Clinton Global Citizen Awards”. 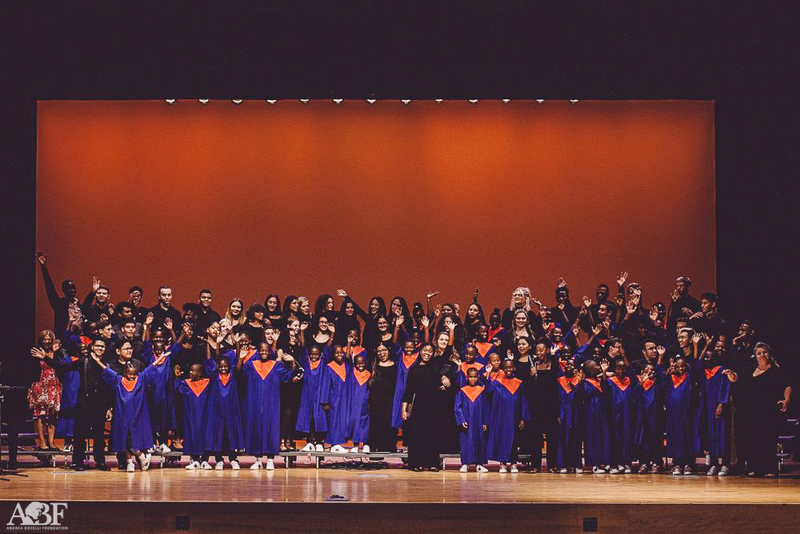 The adventure has come to an end, but has opened many doors for the future of our choir members. Such an experience requires some time to be completely well absorbed and understood. For our young children to properly benefit from the past week, their slightly confused hearts will need a bit of time to analyse all that has happened. The children are coming home bringing along with them memories of music and affection, and essentially a whole new and different world that has suddenly come into their lives and changed them. Their educators and the staff of St. Luc and ABF will need to follow through with the growth of the children, so that they can benefit as much as possible from the experience. It is now time for goodbyes, for hugs and tears and for promises. This was no ordinary experience, it demanded a lot of responsibility, discipline, and even some sacrifices from the children. The challenge was however well handled, and the Voices of Haiti are now a reality. They have been able to perform on very difficult stages (some that represent the culminator of a career for other artists) and they are now ready for new adventures. In 2017, we have planned performances at Madison Square Garden, in Miami and in Europe. There are opportunities for not only the children that came on this trip, but for many others to discover, study, dream and share experiences to help build the future of their country. For who had the honour to stay close to the children, and for those who had the patience to read and follow our tournee through these little travel updates, can be certain that our family is now stronger than ever. The children are all now part of our family. As Andrea Bocelli reminds us, it is not necessary to be altruistic to help them. We just need to understand that their future is also a part of ours.